On Thursday, Natalie, along with cousins Vanessa and Victoria went to Gymboree for some free play time. Natalie is just starting to get used to being around other children again and was not very adventurous. She hung out with me alot and did not appreciate it when I tried to "encourage" her to climb up ladders or ramps. She also took the time to watch the other children play and even though she did not play around too much, I'm sure she's learning how-to play by observing. Eventually, Natalie did wander away from me to... clean up! At home, I've been teaching her to "put back" things and when I point to certain objects, she will happily return things to where she got them. 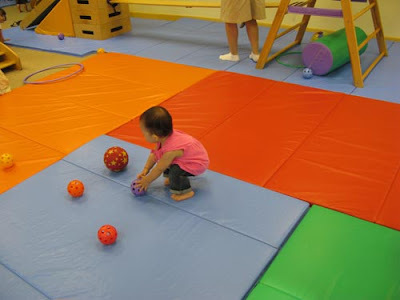 Natalie spent about 10 minutes wandering around the play area collecting balls two at a time. 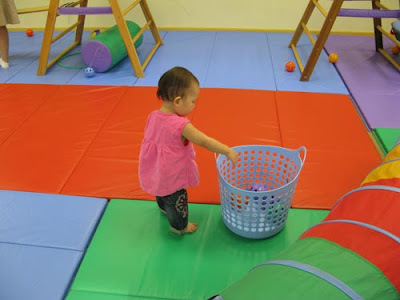 She would toddle back to this blue basket and deposit the balls inside. She wandered far and wide to find the balls and collected almost all of them. Meanwhile, her big cousin Vanessa had a blast climbing and jumping on all the equipment.